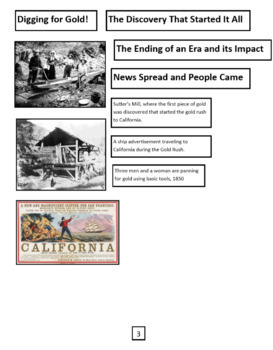 This nonfiction text features sort contains a two page article on The California Gold Rush , 10 text features (pictures, headings, and captions) to cut and sort according to the article's text, and 8 comprehension questions to answer. The questions are STAAR stemmed questions. Use as a lesson on text feature placement within a text, or use in small groups or literacy centers. 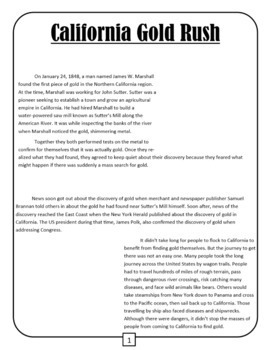 · Nonfiction text features sort -(p. 1-3) Have your students read the article without text features, then cut and sort the text features and place them in the correct places. 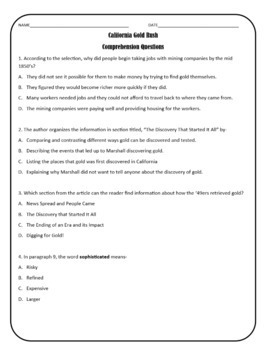 · Nonfiction comprehension- (p. 4-7) Print the article and have your students work on multiple choice questions. · Text features sort and comprehension questions– have students complete the sort and the questions. · Literacy center idea– Have the students work on the text features sort in groups. Print and laminate the first three pages. Cut out the text features. Use 3M Velcro strips on the back of the text features and on the article for your students to work on placing them correctly. 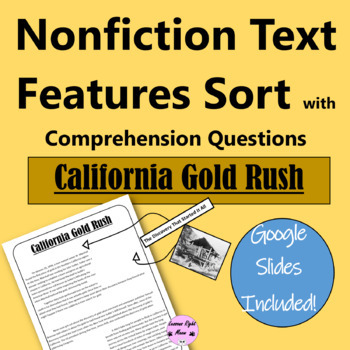 GET THE NONFICTION TEXT FEATURE SORT BUNDLE!!! Get four products like this one: The Underground Railroad, Ellis Island, The Galveston Hurricane of 1900, and Trash in our Oceans for just $9. That's getting 4 for the price of 3! Want more like this? Check these out!